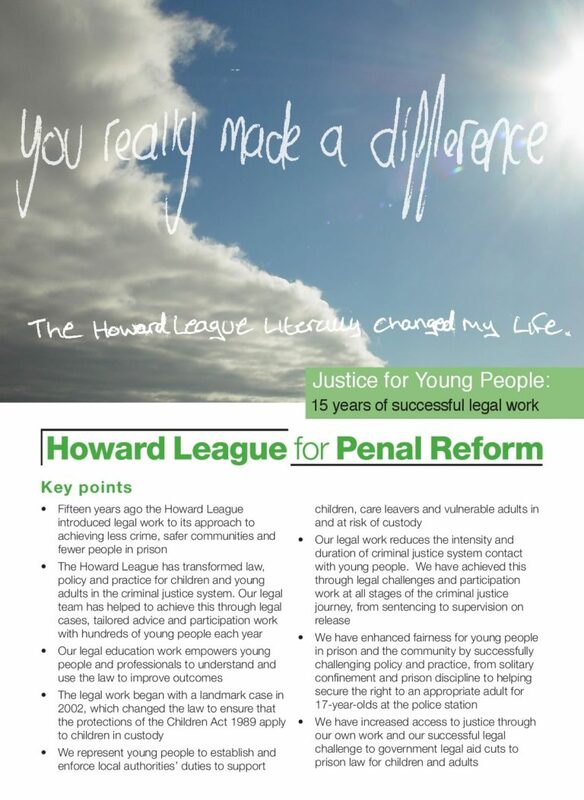 Justice for Young People: 15 years of successful legal work explains how the Howard League set up a legal team to provide prison and civil law support to children in custody. The service was expanded in 2007 to include young adults under the age of 21. The Howard League runs a free and confidential legal advice line, which helps more than 1,000 children and young people a year. The legal team has challenged the use of solitary confinement on children, unlawful punishments, lack of education and the failure of local authorities to provide appropriate support for children on release from prison. The Howard League has intervened in cases on a range of issues, from the need for appropriate adults for 17-year-olds in police stations to discrimination against women as a result of the sparse geographical spread of approved premises.